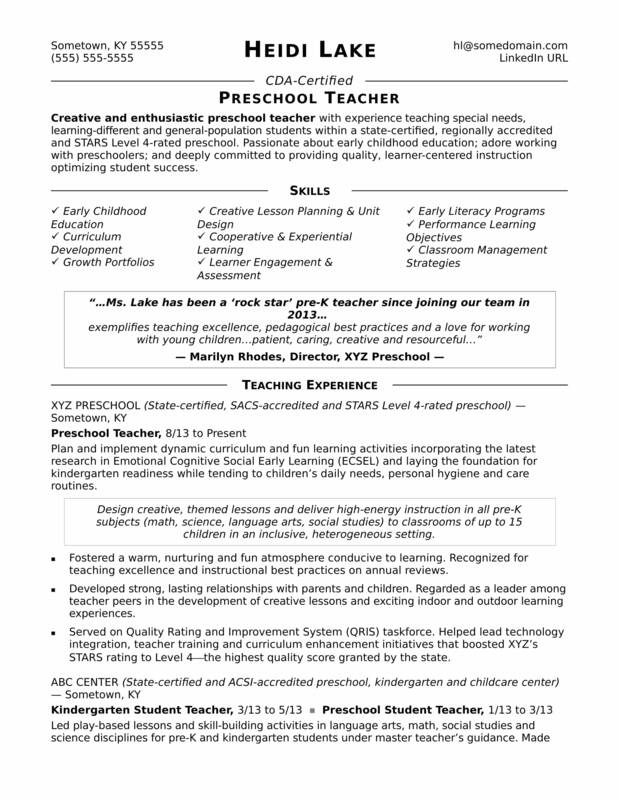 View this sample resume for a preschool teacher, or download the preschool teacher resume template in Word. Is your resume ready to graduate to the big time, or is it still in need of a few basic lessons? To be considered for coveted preschool teacher jobs, resume expert Kim Isaacs says it helps to have a comprehensive resume. For resume writing tips, view this sample resume for a preschool teacher that Isaacs created below, or download the preschool teacher resume template in Word. Jobs for preschool teachers are projected to grow by 10% (or 50,100 jobs) from 2016 through 2026, which is faster than average, according to the Bureau of Labor Statistics (BLS). You'll find the highest level of employment for this job in the following states: California, Texas, New York, Florida, and Illinois; and in the following metropolitan areas: New York City, Chicago, Los Angeles, Houston, and Atlanta. As a preschool teacher, you can expect to earn a median wage of $28,990 per year, or $13.94 per hour, according to the BLS. Additionally, you can learn about education careers and search for preschool teacher jobs on Monster. Creative and enthusiastic preschool teacher with experience teaching special needs, learning-different and general-population students within a state-certified, regionally accredited and STARS Level 4-rated preschool. Passionate about early childhood education; adore working with preschoolers; and deeply committed to providing quality, learner-centered instruction optimizing student success. Plan and implement dynamic curriculum and fun learning activities incorporating the latest research in Emotional Cognitive Social Early Learning (ECSEL) and laying the foundation for kindergarten readiness while tending to children’s daily needs, personal hygiene and care routines. Design creative, themed lessons and deliver high-energy instruction in all pre-K subjects (math, science, language arts, social studies) to classrooms of up to 15 children in an inclusive, heterogeneous setting. Fostered a warm, nurturing and fun atmosphere conducive to learning. Recognized for teaching excellence and instructional best practices on annual reviews. Developed strong, lasting relationships with parents and children. Regarded as a leader among teacher peers in the development of creative lessons and exciting indoor and outdoor learning experiences. Served on Quality Rating and Improvement System (QRIS) taskforce. Helped lead technology integration, teacher training and curriculum enhancement initiatives that boosted XYZ’s STARS rating to Level 4—the highest quality score granted by the state. Led play-based lessons and skill-building activities in language arts, math, social studies and science disciplines for pre-K and kindergarten students under master teacher’s guidance. Made content engaging and accessible for diverse learners that included special needs (e.g., autism spectrum, ADHD) and general-population students. Granted, preschoolers can't appreciate a well-crafted resume, but you know who can? Hiring managers. Could you use a little extra credit in that department? Get a free resume evaluation today from the experts at Monster's Resume Writing Service. You'll get detailed feedback in two business days, including a review of your resume's appearance and content, and a prediction of a recruiter's first impression. Let the experts at Monster give you a hand with one of the more important assignments of your career.